The 1980s were a time in Canadian music when radio listeners were inundated with artists who, by law, made the airwaves based on their birth certificates rather than on their talents. A bright spot during those dark dark days were the Northern Pikes. The band penned catchy tunes and seemed to have a lot of fun doing it. 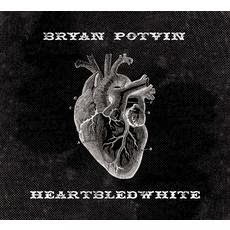 Now, Bryan Potvin, a founding member of the Northern Pikes, has a new solo album, the 12-song strong Heartbledwhite. The dozen cuts on the album demonstrate a very eclectic set of influences. A bluesy keyboard squelch blasts you on "It Don't Bother Me". Potvin transitions effortlessly from the funky, rump-shaking "Gotta Know Myself" into the energetic country flavour of "Fire and Gasoline". "Someone Like You", not the Van Morrison wedding standard, is a soaring skyscraper of a track. Pop rock is behind almost everything though. The slightly snotty vocals on "Standing By You" mesh perfectly with the always catchy handclaps. "Crazy" is a little dose of light summertime pop. There are certainly some down moments on the record too. The opener, "River of Hope", is a fairly standard cookie-cutter pop rock song. The mellow "Anymore" is middling at best. Despite some very personal lyrics, "Wistful Sun" fails to connect. Heartbledwhite isn't going to blow your socks off, but it is a fine piece of summer listening. Bryan Potvin plays Roncy Roots on June 14th. Best tracks: "Standing By You", "Fire and Gasoline"